This page looks very similar to The Field Definition Dialog, but contains different data. The field definition dialog contains all the fields (or all the unknown fields) of the currently converted file. This, the field settings dialog, is file independent; it contains all the fields that have been defined so far. This is the database, as it were, from which converted files are evaluated. 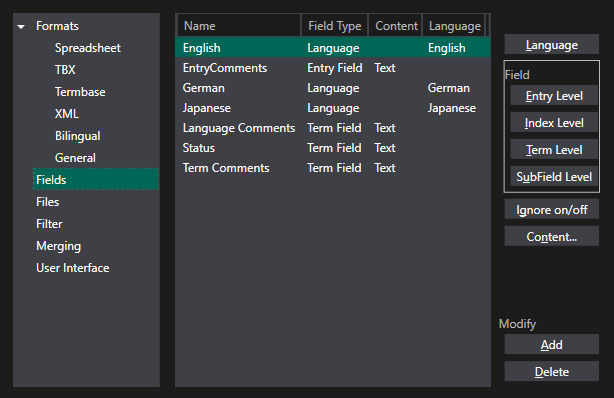 If you add, for example, a field called "Allemand" and define it as a German Language field, all future files that contain a field called "Allemand" will automatically know it is German. There are two extra buttons, Add and Delete, that allow you to maintain the list. Note that characters in a source field name that are not safe in XML are replaced by _underscores_; these characters are < >\ & ; ’ ” and blanks. It's not recommended to use such characters in column headers in the first place.